What happens to us when we die? It’s a question that is bound to cross all of our minds. Where do we go? Do we remember our lives? Who’s there with us? Though the answer may not be known, the guesses are unbound. The end of Shakespeare’s classic love story, Romeo and Juliet, our star-crossed lovers’ ill-fated romance ends in death with the curtain shortly falling. In Erin Breznitsky’s dramedy R+J, Breznitsky conjectures their afterlife as they are reunited in what is certain to be the worst layer of hell. With a company mission to strip down the play to its bare essentials and tell the story using the power of langue, R+J is an adaptation of the quintessential romance that does just that. 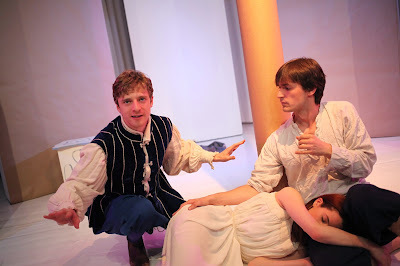 Presented by The Rogue and Peasant Players, R+J follows the titular characters of Shakespeare’s familiar work as they test the limits of their love in the afterlife. After discovering that they both needlessly killed themselves in an act of love, R and J get exactly what they wanted, to be together. But as eternity clicks on, they soon realize the honeymoon phase isn’t quite what it’s cracked up to be. Were they truly meant to be together? The couple is forced to watch their lives, or the play, played on continual loop, forcing them to question their actions. Breznitsky’s thesis of a love that shouldn't have been is wonderful. Audiences have always questioned the validity of the young lovers, but Breznitsky gives them the opportunity to discover that answer. While the conceit of the play is exciting, Breznitsky's script could use some dramaturgical assistance. The rules of her world are a bit inconsistent. It is established that in this hell-like afterlife, R and J, who, once dead, speak in a contemporary voice, are haunted by their actions, forced to watch every single scene over and over again, in a Shakespearean voice. R and J are completely unable to communicate with the Bard versions of themselves. They are completely unable to escape them, no matter where they try to run off to. The pair is led to believe that they too, are unable to escape each other. But then Breznitsky and director Kelly Monroe Johnston break these rules by the end. While J's late monologue to R in regards to leaving one another leads to forgetting is simply stunning, it seems to break the rules of never being able to make the play cycle stop, destroying what was previously established. The numbers that R and J throw out on how much time has passed may be arbitrary, when they do part, how can they forget one another if they are forced to watch Romeo and Juliet? Shouldn't there be an inkling of memory? With the device of using Shakespeare’s text as an integral element to the script, Breznitsky layers in way too much of each individual scene. The draw of the play is her language and her exquisite way with words. With nearly a fifty-fifty split of contemporary and Shakespeare text, using so much of the scenes truly detracts from the plot of Breznitsky’s play. The core ensemble was filled with actors who had a wonderful grasp on the Bard. With each actor taking on the star crossed lovers, we were given so many variations of the pair. From the typical perfect casting of Thomas Leverton as Romeo and Dee Dee Popper as Juliet to the gay version with Leverton and Anthony Michael Martinez taking on both Romeo and Juliet. These concept castings are some that would actually be intriguing to see. But the focal point of this play was not the core ensemble but the contemporary spoken R and J played by Tim Dowd and Malka Wallick respectively. Watching Dowd and Wallick portray versions of Romeo and Juliet with a backdrop of other capable options was almost a disservice to the them. It's quite possible this was Breznitsky's intention. Some of the core actors, including the ideal Romeo Leverton, the darling Brenna Yeary, and the diverse Sarah Bonner, were more captivating to watch on stage. While the journey the pair went on was that of any couple, the qualities Dowd and Wallick had to display made the characters unlikeable, by no fault of the actors. Wallick’s J was whiney while Dowd’s R was stubborn. With a happy ending after all, it may be hard for the audience to get on board with R and J ending up together with the lack of cohesion. Director Kelly Monroe Johnston had virtually a clear slate in which to create. With a white box theater as the blank canvas, the scenic design consisted of brown paper covered panels and a giant pillar, forced by the architecture of the space, that is nothing short of obnoxious. While the paper effect allowed for R to write on, it artistically added nothing to the production. The layout Johnston crafted on stage allowed for some clever theatrical magic to occur. Johnston did his best to keep the action downstage of the pillar of doom, but alas, it got in the way of sight lines at times. Johnston did an exceptional job guiding the core ensemble through the Shakespearean scenes. It was the contemporary scenes that needed more work. While the program note discusses the intent to strip the stage of concept and design, it's quite interesting to see the commentary in regard to the endless concepts Romeo and Juliet has been put through. Sometimes the idea of less is more in theater is beneficial to a production. Other times, it’s not. While Breznitsky’s script may be simple, it does require a little bit of artistic substance to establish the world in which R and J now live. Perhaps with a more clarity and a bit more work, R+J could be something of note.